With so many places to fish in the world, you might have some trouble narrowing it down. I’m here to tell you that you should choose Destin. There are tons of reasons to go fishing in Destin FL. Once you look at the reasons, you will finally see what so many other people know. There’s no better place to go fishing than Destin. First of all, I love all of the choices I get when I go fishing in Destin FL. From charting a big party boat to going on a private charter or fishing off the pier, you have tons of options when you go fishing in Destin FL. All of these options mean you can catch tons of different fish. 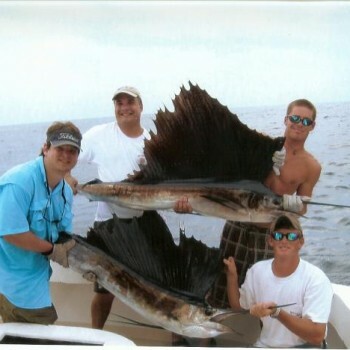 Whether you are looking for mahi-mahi, redfish, king mackerel, shark, or something else, there is a very good chance you can grab it when you go fishing in Destin FL. Only one place has the title of the World’s Luckiest Fishing Village, and that one place is Destin. Destin has that reputation because people reel in some of the biggest fish around, thanks to the easy access to deep water. That means you can get to the fish faster and reel them in sooner. That’s a great reason to go fishing in Destin FL. I love a good competition, which is why I love the Destin Fishing Rodeo. The rodeo takes place during the entire month of October and is one of the best fishing events around. It alone is reason to go fishing in Destin FL. Now you’re probably itching to throw your line in the water. Don’t waste any more time. Start planning your trip and you will be fishing in Destin FL in no time at all.